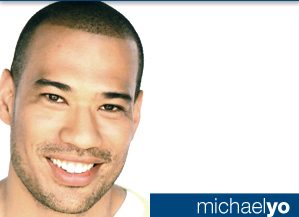 Did you know that E!’s (correspondent/”Kourtney and Khloe take Miami”) Michael Yo used to be known as Johnny Blaze? That’s right, Central Texas readers. Long before Bobby Bones was on in the morning – to be honest, they were STRUGGLING for a good morning show before him; they rotated shows about four times a year – Johnny Blaze ruled the DJ spot on 96.7 KHFI. Yes, before they were KISS! Crazy right? He did the night show and I remember calling him several times – we even got a pic with him at a Backstreet Boys concert. Who knew?! I remember getting an autographed pic in the mail from him after winning a contest… now he’s producing shows for the Kardashians.